(Crisis Magazine) There is a warm spot in my heart for Sir Cecil Spring-Rice because he loved Theodore Roosevelt and disdained Woodrow Wilson. He also wrote the hymn “I Vow to Thee My Country” which some progressivists have forbidden their shrunken congregations to sing because it speaks of a real heaven, and a life of sacrifice. He said affectionately of Teddy: “You must always remember, the president is about six.” In the instance of his subject, that bespoke an innocent exuberance which sometimes tottered on the brink of vainglory and romance, and later led to the disaster of the Bull Moose Party, but which also impelled the Rough Rider up San Juan Hill (Kettle Hill for pedants). That was a flourish of innocence, as distinct from naiveté. For naiveté is to innocence what superstition is to faith, optimism to hope, and sentimentality to love. In our day we have witnessed hearty public figures political and religious, fudging those distinctions and visiting mosques and bantering as though they were in a Kiwanis club. As they do, Christians are being killed in foreign lands by the disciples of Mohammed, whom the politically cautious say has been misunderstood by his extreme devotees. If that is so, we have yet to hear censure from the more moderate clients of that enigmatic figure who slaughtered many with his own sword. Images of Christian infants cut in half and children beheaded in Iraq, show that Herod is alive, and those of us who wear crucifixes now can see pictures of young men being crucified, as warnings that the cross is not an ornament designed by Tiffany for debutantes. Agony is not a topic for humor. His century’s master of the English language, P.G. Wodehouse, recognized as such by T.S. Eliot, Evelyn Waugh, Graham Greene and Churchill, broadcast from his internment camp ambiguous jokes about the Nazi genocide. “Risus abundat in ore stultorum.” Wodehouse was a gentle naïf, and, while distracted by golfing, he suffered under a lifelong cloud thereafter until he was decorated by his Queen who recognized that there was no malice in the man who never aged from six to manhood. There are those on the public scene today who do not have his excuse of permanent childhood. That 1933 New York rally was succeeded in 1939 by another in the same arena, when 22,000 pro-Nazis, inspired by figures including the universal hero, Charles Lindbergh, whom the world thought could slow the rise of the oceans and heal the planet, boasted that the enemy was not an enemy. They spoke under a large picture of George Washington who, they said, was one of them because he was an Aryan. A grave in Mount Vernon must have rattled, but ideology has no patience for fact. Today, the weaker voices who place politics above prophecy and popularity above the people, may say as some Frenchmen in the 1930s, understandably weary of war, said as they looked the other way, “We will not die for Danzig.” Bombs and shrapnel soon spelled out that Danzig was a cipher for all humanity. If a prophet is not without honor save in his own country, a great prophet is not without honor save in the whole world. 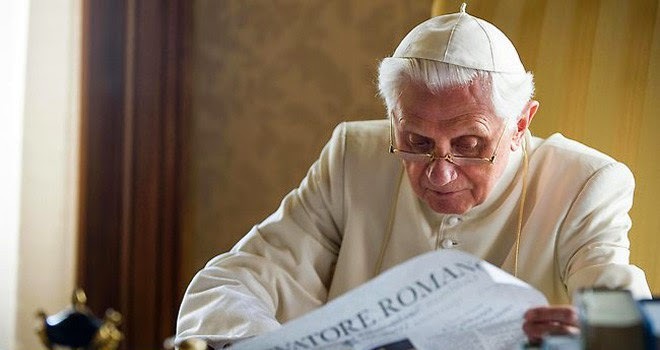 Pope Benedict XVI bent under that mantle in 2006 when he spoke in Regensburg. His only miscalculation was to assume that civilization might still be civil enough to respect reason. Quoting the Byzantine emperor Manuel II Paleologus, himself a remnant of a decaying civilization which still distinguished good from evil, he considered how the Islamic notion of a divine power divorced from reason, whose absolute will is its own justification, could ransack the dignity of man. He condemned no one, and spoke only for truth without which the votaries of unreason, for whom there is no moral structure other than the willfulness of amorality, and whose God is not bound by his own word, rain down destruction. The president of Argentina, the problematic Christina Kirchner, said that the Pope’s remarks were a “diatribe” and “dangerous for everyone.” A supporter of Kirchner, the left-wing “investigative journalist” Horatio Verbitsky, adept as a conspiracy theorist, claimed in the journal “Pagina/24″ that Cardinal Jorge Bergoglio, at that time archbishop of Buenos Aires, had distanced himself from the Regensburg address, and the cardinal’s spokesman, Father Guillermo Marco, was quoted in Newsweek Argentina as saying that Bergoglio was “unhappy” with what Pope Benedict had said. The London Daily Telegraph made the same claim with nothing more substantial than the article in Newsweek Argentina. It is the case that another Argentinian archbishop, Joaquin Pina, criticized the Regensburg thesis, four days after which the Holy See accepted his resignation, but he already was one year past retirement age. These few years since have seen written in the suffering of distressed souls what Pope Benedict described calmly and charitably. Such a short time can sharpen perceptions, and Pope Francis, whom we are assured is close to Benedict, has recently said from his humble abode: “The news coming from Iraq leaves us with dismay and disbelief.” Consequently, the Holy See conceded that military action may be needed to stem the atrocities of the Islamic State of Iraq. Only time will tell if that is a day late and a dollar short. Pythagoras’s belief that history repeats itself is a notion contrary to Christian progress, but all history attests that mistakes can repeat themselves, and the only way out of that fatal trap is to admit error and make amends. Both Benedict and Francis continue to grace the world with their obedience to the Logos. Should the God of Love call Benedict first to his heavenly home where humility’s only advertisement is the peace which passes all understanding, may Francis or another successor of Peter, declare Benedict a Doctor of the Church. Of one thing we may be certain: like the bold prophet Jeremiah, the benign prophet Benedict will never say in this world or from the next, “I told you so.” Reality has said that already by events more than words.